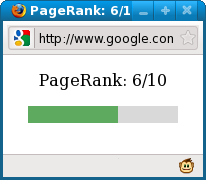 Updated 2011-10-06 with Google's new Pagerank URL. Update both your bookmarklet and userscript for the change to take effect. Toolbars and addons show you the PageRank of every page you are visiting. In order to do this, a request is sent to Google for every page. As a result Google's log will contain every page you ever visited. That's a privacy concern that could be solved by asking the PageRank only for pages that you are actually interested in. Online PageRank tools rely on a third party that will act as a go between to calculate the hash value (see below). These services are sometimes unreliable and they often cease to work because Google does not allow automated queries. If we ask Google directly for the PageRank we no longer need a third party but then we need to calculate the hash value ourselves. To install the bookmarklet (below) simply drag it to your bookmarks or "right-click" on the link and save it as a bookmark (or add to favorites). You can then execute the bookmarklet when visiting a page, by clicking on the bookmark. Google PageRank - Bookmarklet to retrieve the Google PageRank directly from Google. The results shown by the bookmarklet, do not look very nice, a page with PageRank 4 will give us Rank_1:1:4, while a page without PageRank is simply blank. The bookmarklet cannot change the appearance of the result as a script is not allowed to change pages on other sites for obvious security reasons. However the Greasemonkey userscript (below) will beautify those responses and transform it into a standard looking Google PageRank bar. You'll need to use Firefox with the Greasemonkey addon and if you do just click on the link below to install the userscript. 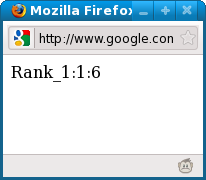 PageRank Beautifier - Userscript to beautify the Google PageRank result (Firefox with the Greasemonkey add-on required). So there you have it, unlike other PageRank bookmarklets, this bookmarklet does not depend on any third party to work, everything is taken directly from Google's servers and unlike toolbars or addons not all of your activities are logged by Google. Enjoy!